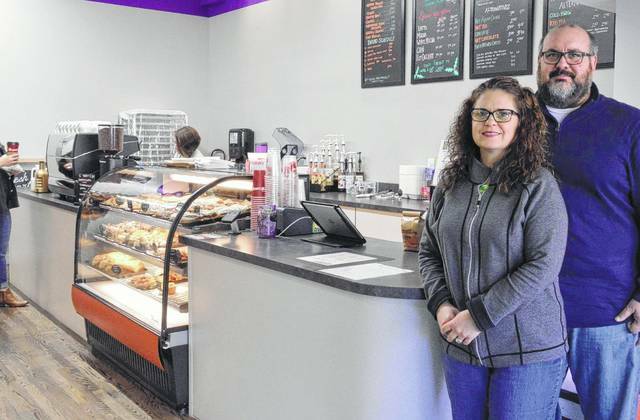 Leigh and Todd Daughenbaugh pose inside their business, Fresh Start Cafe and Bakery, in this file photo taken in late 2016 for a feature story that appeared in The Gazette. The inaugural Fresh Start Baking Championship, which is set to take place in February in the downtown Delaware business, is the brainchild of Mr. Daughenbaugh. When it comes to mastering the art of baking, many people believe their grandparent, parent, or significant other is the best. To help settle the claims, one local business owner is giving area home bakers the chance to showcase their talents in the inaugural Fresh Start Baking Championship to be held in February. At stake is the title of “Best Baker 2018” and a prize pack featuring a KitchenAid mixer, a USA Pan bakeware set, a spot on the Fresh Start annual Best Baker photo wall, a trophy, free entrance into the 2019 contest to defend the crown, etc. Todd Daughenbaugh, owner of Fresh Start Cafe and Bakery at 24 N. Sandusky St. in downtown Delaware, said he came up with the idea to host the baking contest in hopes of starting an annual tradition that recognizes what he feels has become the lost art of home baking. Open to any home baker not currently employed as a professional baker or professional baking instructor, the contest will require each contestant to showcase their all-around baking skills by participating in three categories: pastry and dessert (croissant, cake, pie, brownies, cookies, etc. ); chocolate, candy, and confections (brittle, fudge, bonbons/truffles, custard/pudding, etc. ); and breads and doughs (cinnamon rolls, biscuits, doughnuts, etc.). On separate Sundays throughout the month (Feb. 11, 18, and 25), contestants must present a baked good for that particular category being judged that day at Fresh Start Cafe and Bakery. Since the establishment doesn’t have the room to allow multiple bakers to work simultaneously, nor the equipment or ingredients necessary for such a competition, participants will need to prepare their entries at an off-site facility. Daughenbaugh said there will be three judges for each category, and the judges will be a mix of members of the Fresh Start baking team and industry experts. There is a $75 fee to enter the Fresh Start Baking Championship, and the deadline to register in person at Fresh Start Cafe and Bakery is 5 p.m. on Feb. 6. In order for the competition to take place, there must be a minimum of 15 participants, but no more than 25 will be allowed to register, Daughenbaugh said. For additional information on the contest, email FreshStartCafeAndBakery@gmail.com.